John Calhoun Baker (1895–1999) served on the Dumbarton Oaks Administrative Committee between 1942 and 1945. A skilled education administrator with a shrewd mind for business, Baker contributed much to the early development of Dumbarton Oaks. Baker graduated from Juniata College in 1917 before receiving an MBA from Harvard Business School in 1923. After brief stints working at an advertising agency and a piano company, Baker returned to Harvard Business School in 1926 as an instructor of foreign relationships and trade. Within two years, Baker was appointed assistant dean of the business school. He continued to climb up the ranks, becoming associate director of business research in 1936 and professor of business administration in 1940. In 1941, he became an associate dean of the university, assuming many of the responsibilities that had formerly been assigned to the vice president of finances. Possessing both financial and administrative operational skills, Baker was a natural choice for the new Dumbarton Oaks Administrative Committee, which was responsible for the supervision of the institution and for authorizing expenditures from the budget. Baker’s responsibilities on the Administrative Committee occasionally became paternal and personal. In his first year, for example, Baker became concerned about the health and morale of the Fellows in the bleak atmosphere of the Second World War. Anticipating the possibility of a coming food shortage, Baker suggested that the Fellows be offered an opportunity to grow personal gardens so that they could cultivate some of their own food. 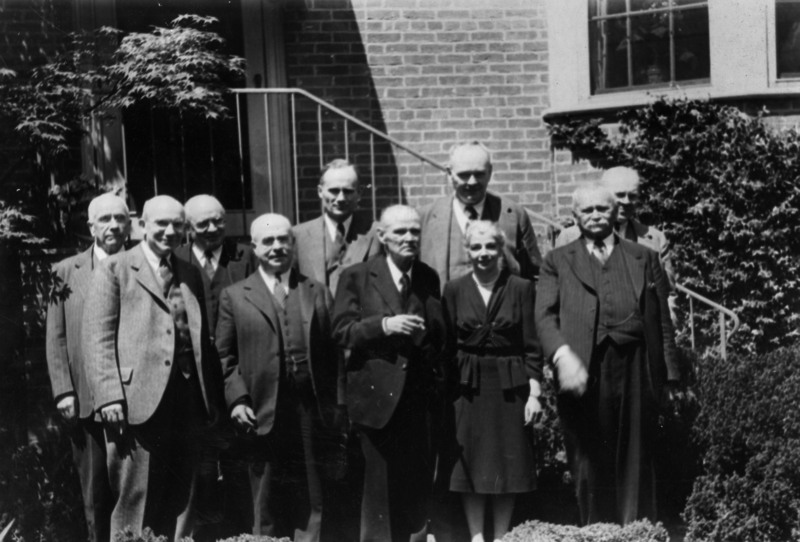 Dumbarton Oaks Administrative Committee, 1944: Back row: Edward K. Rand, George La Piana, John C. Baker, Robert Blake, Charles Rufus Morey. Front row: Albert M. Friend Jr., Paul Sachs, Michael I. Rostovtzeff, Sirarpie Der Nersessian, and Alexander A. Vasiliev. In this country of great energy and rapid growth fine arts and the humanities are often neglected. Potential scholars in the daily struggle to make a living neither have time to con­template nor to complete their scholarly work. Able students for want of funds turn to college or secondary school teaching or business instead of scholarship. In many universities pupils and teachers are unable to work together chiefly because of the large number of students a professor must teach, or because physical conditions are such as to make association impossible. Often Scholarship is forced to exist in narrow, sectional grooves rather than in a friendly international atmosphere. All of this was and is known by Mr. and Mrs. Bliss as well as by Harvard authorities and Dumbarton Oaks was planned and is being operated to offset some of these almost insuperable handicaps to American scholarship. The full text of John C. Baker’s address, “Harvard at Dumbarton Oaks,” can be found here.